Brightpod is one of such application anyone would like to use. Having strong Project Management capabilities, this amazing tool acts as a perfect Project Managing partner for your business. The application is a web-based project planning and tracking application. Additionally, the most promising part is, it is completely online (web based). That means, you don’t need to download anything or configure anything before you get started. Also, the cloud storage makes your machine independent and ensures the security of your valuable data. A pod can be used as Blank Pod or a Pod from a Workflow. The calendar in the application gives overview of all your tasks across all projects. You can even add events to the calendar. 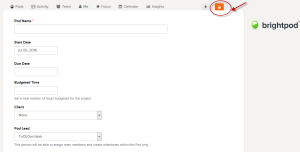 The calendar can show you projects filtering time slots on Month, Week, and Day. Calendar can add Events, Milestones, and Tasks.The feature can also filter items using: Filter by Client , Filter by Team Member, and Filter by Task type. The team feature lets you invite team members and collaborate with them. You can add new members and freelancers from right inside this section. The Add People button opens up a short form you need to fill in to invite people adding details such as: Email Address, User Role, Is Part of Group, and Which Pods can this User Access. This is one of the strongest feature of Brightpod. This section lets you keep updated with your business activities. The Focus section displays important tasks. This also helps you to make plans for current and top priority tasks. The Focus section has categories- Today, this Week and Someday. You can drag task and activities across these sections and better manage your daily goals. 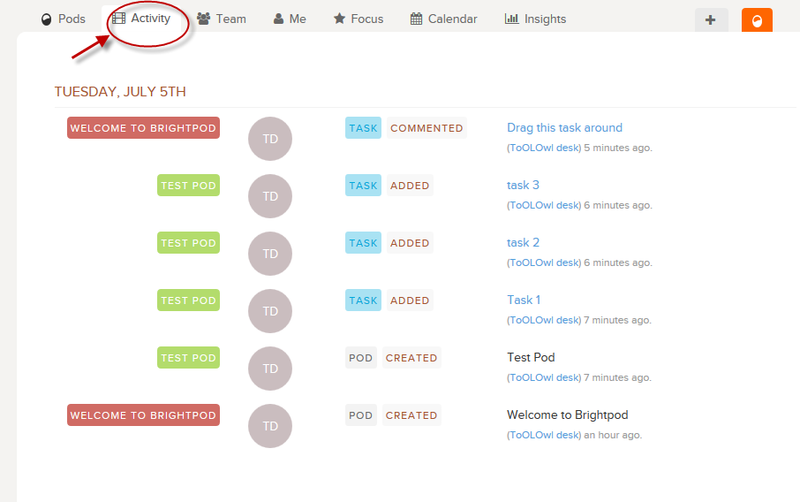 The Activity feature maintains a log of all the things done by you or your team members. This features keeps you updated of all the activities done with details such as Tasks and Pods added, their Status (added or committed) and time of creation. This will answer questions like what all tasks have been done during past 7 days. 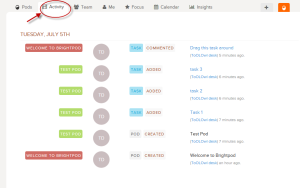 This gives details about tasks added, completed and what all is due across a project. This feature can very effectively displays activity items such as- Pods, Milestones and Tasks with their progress and Status. 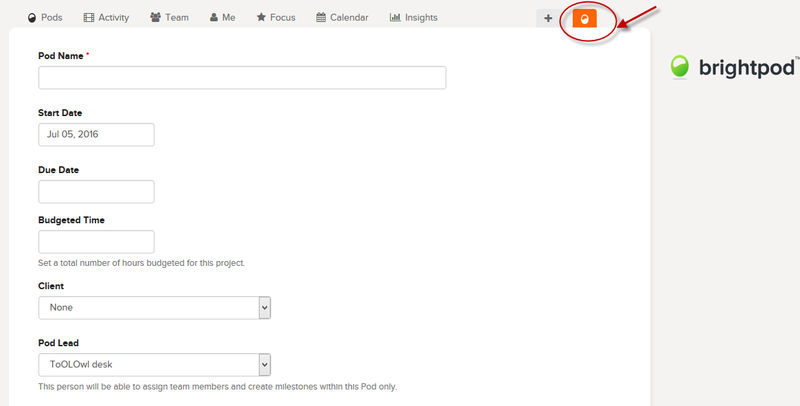 The filters on the Right panel lets you filter out activities on the basis of: Pods or Clients, Team Members, and Date. The application is currently unavailable on mobile platform. 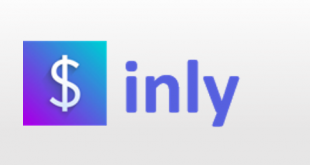 The application integrates with DropBox, Google Drive, Gmail and Box. 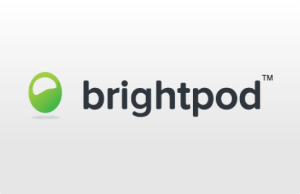 Brightpod offers a strong support system for all its users. The tool offers an online chat support right inside the application. An FAQ section on the website with video tutorials. Highly secure for your projects. The users may become overwhelmed and confused with so many features at a single place. It may take some time to speed up work process for the beginners. 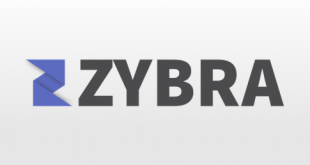 Personalized Project Management and Collaboration. Have inbuilt features for SEO and Marketing activities. Multilingual- Works for French, German and Portuguese users. The Archive feature will make you recover anything removed past 30 days. 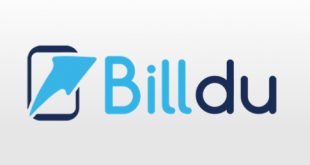 For more details, please visit Brightpod website .